This continues from Costuming Project: Steampunk Loki Jacket, where I outlined the first steps in finding a suitable base coat and did some basic shaping. Now it’s time to create more intricate decoration and add some color to the project. Loki’s movie jacket is black and overly brilliant green with gold embellishments. These are the colors of a comic book character. While I damn near always go for ostentatious in my steampunk costuming, often bordering on absurd, those colors are just not what I’m looking for. Luckily, this isn’t cosplay. There’s nothing that says I have to use those colors at all. Loki’s costume is a point of reference, not the end goal. I debated going with black and purple, for example, for no better reason than I like purple. In the end, I decided to go with the general movie scheme, just more muted. I bought four ¼ yard strips of fabric as samples. Altogether, they cost $12, and I figure I’ll use at least half of the material. I was very lucky in that I could find similar golds and olive greens in two different materials, one silky and one micro-suede. As an Aside: They referred to the silky material as “man-made silk.” I’m pretty sure that means polyester, although Wikipedia tells me it could also be acetate, which is technically a plant-based material because it is manufactured from cellulose. Never feel compelled to use historically accurate materials. Silk can be 10 times more expensive than man-made materials. I flat out can’t afford that, and certainly not when I’m playing fast and loose with my materials. There’s a lot of polyester in my steampunk closet, including one marked “polyester with polyethylene coating.” Ew. I hold the fabrics up to the jacket to get a better idea how to put everything together. While I loved the gold coloring in the store, now I see it’s too stark a contrast. The green suede doesn’t contrast enough, so I decide on the silky/acetate/polyester/I-don’t-really-want-to-know green. The suede looks more functional (and more like the original), but my persona is not terribly into practical fashion. This is meant to be elegant, which is rarely practical. This will also let me eventually make a matching silky skirt. As an Aside: Consider making color decisions early. When I concluded I needed more silky green, my fabric store was completely out of it. I had to travel to another store to find it, and they were almost out. Also, some colors vary tremendously between dye lots. My original green suede is far brighter than stuff I bought later. The drawback of early purchases is you’re more likely to end up with unused fabric. The yellow gimp braids never made it into the project but are included for comparison and reference below. Trim is amazing stuff. I stick it to darn near everything. It instantly gives a hem a more finished and elegant look while requiring relatively little effort to add it. A bit of trim, however, can go a very long way. I’ve never used a trim that’s more than 5/8″ in width, which is the wide black trim used here. 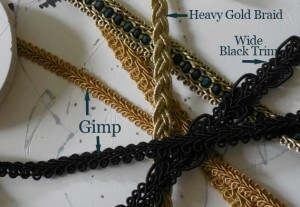 The gimp is 3/8″ and the heavy gold braid is 1/2.” It should embellish, not overwhelm, your project. You should be even more limiting with metallic trims. They steal the show pretty fast. Now, I ended up using a fair amount of it, but the entire project is a bit over the top. As an Aside: Ok, a lot over the top. But I still carefully planned the use of metallic trim. Black is a no-brainer as it matches everything. If you’re making something light colored, white behaves the same way. Browns, however, come in a variety of warm and cool versions, which may or may not clash with your materials. I was originally planning using the black and non-metallic gold gimp braid. I really wanted olive green gimp to match the fabric, but I couldn’t find any. I did, however, find a great metallic gold and green trim. This now posed a problem. The gold gimp didn’t match. It’s not metallic, and its color is darker and richer. So out the door it went. I was not, however, about to hem the entire coat in gold and green. Too much. So I sought out a pale, metallic gold trim. Pale is important. A lot of metallic gold materials are deep-yellow. That’s not the tone of the gold I’m using. The heavy gold braid was one of the few that matched. It’s drawback is that it is really thick. I had to hot glue it because there was no way a needle was going through both it and leather. There is a point when you’ve stared at a project too long. I start second guessing myself. At these points, I run to my husband with the coat, color samples, and/or braids. Fresh pairs of eyes are good. His opinions were a tremendous help, particularly when he encouraged the use of the flashy metallics, which I kept doubting. Personally, I think the question “Which one looks best?” works better than “Does this one work best?” It loads the question, forcing your friend to agree or disagree with you rather than expressing an unbiased opinion.